A great many Serious light owners suffer from eye conditions, and for some everyday vision is seriously affected. For over 75 years the Guide Dogs charity has campaigned to make life easier for those with visual impairment, and their latest campaign is a perennial bugbear – pavement parking. Cars parked on pavements pose a serious danger to people with sight loss and many other pedestrians, including wheelchair users, older people and parents with pushchairs, by forcing them out on to the road. The charity is calling yet again on the Government to stop problem pavement parking, and has launched a new petition urging the Government to make pavement parking illegal, except in certain areas allowed by local councils. The campaign is supported by more than 30 other charities and organisations who want to see a new nationwide law in place. We are pleased to learn that Guide Dogs will be raising awareness of sight loss-related issues at the Optical Industry’s premier event, Optrafair 2017 at Birmingham NEC from 1-3 April. As an exhibitor at the show, we look forward the signing the petition. If you cannot make the event and would like to support the campaign, please sign the petition here and find out what you can do to help. 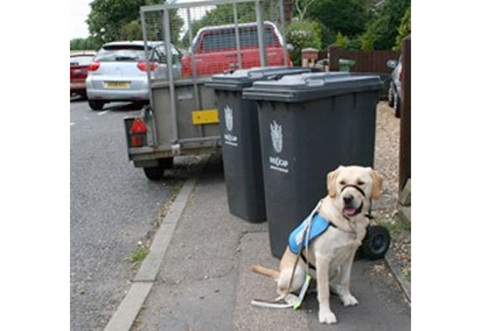 Guide Dogs: Time for pavement parking to hit the road.